and talk about it gentle, in classic style. 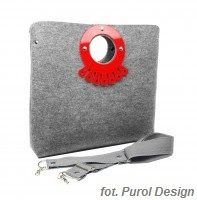 Purol Design will help us by using felt to make everyday things more and more beautiful. felt is trendy. felt could be vintage and glamour. classic and creative. beautiful bags created by Purol Design intergating all this features. Purols are offering bags for every Elegant Young Laydies (EYL) ;) and for guys crazy about eco style.